Shawn Holt & The Teardrops have been signed to Blind Pig Records. Holt is now fronting his late father Magic Slim’s band The Teardrops, which includes another Lincoln musician, Levi William. 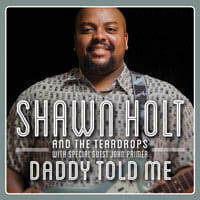 The band’s first CD, Daddy Told Me, is set for release Sept. 24 and includes five songs written by Shawn Holt and two written by Magic Slim. Holt celebrates his birthday with a Lil’ Slim Blues Band show at Lincoln’s Zoo Bar Saturday, Sept. 7, 9 p.m. Hullabaloo Music & Camping Festival is back for its third year in a new location, Sokol Park, 915 Allied Rd., Bellevue. The event runs Thursday, Sept. 5, through Sunday, Sept. 8, with multiple bands every afternoon and evening. The event is the brainchild of Kris Lager Band bassist Brandon Miller. The Sokol Park location allows for continuation of the funky forest walk and additional events like midnight movies and Frisbee golf. Most of the blues-related acts play Sunday, Sept. 8, including Samantha Fish (6 p.m.), Kris Lager Band (7:30 p.m.), and The Monophonics (9 p.m.). The Monophonics also play Saturday night (10:30 p.m.). Ticket options include all four days or single day passes. See hullabaloomusicfestival.com for prices and schedules. Terry O’Halloran’s Sin City Soul & Blues Revival is Sept. 15-17 at The Rio All-Suites Hotel & Casino in Las Vegas. Over 40 national blues acts will perform on three stages. It is sure to be one of the biggest blues parties of the year. Check the website at sincitysoulandbluesrevival.com for last-minute discount options on festival packages with up to 50% savings. Due to high demand, music-only wristbands are also available now for all three days or individual days. The Hive is on the move. Jake Gardner’s Hive Rock Club & Art Gallery is relocating to 1207 Harney St. The Hive will continue to present live music while adding a craft cocktail menu. A grand opening is scheduled for mid-October with the new Hive open for business in mid-September. See facebook.com/theHiveLounge. The former location at 1951 St. Mary’s will operate under the name Venue 51 under the new ownership of Becky and David Benson. Gerardo Meza’s 50th Birthday Bash takes over Lincoln’s Bourbon Theatre Friday, Sept. 6, 8 p.m. with music from Meza’s rockabilly band The Mezcal Brothers plus Josh Hoyer & The Shadowboxers, The Bottle Tops and Jack Hotel. Acclaimed Texas American musician Terry Allen appears at Slowdown Saturday, Sept. 7, 8 p.m.
Writer’s Note: Breaking 21st Saloon update: Andrew Jr. Boy Jones from Texas appears at The 21st Saloon Thursday, Sept. 5, 5:30-8:30 p.m. Jones is a former sideman for Freddie King and Charlie Musselwhite. Check his bio at http://www.bluesart.at/NeueSeiten/ANDREW%20JR.%20BOY%20JONES.html. 2013 International Blue Challenge winners the Selwyn Birchwood Band have swapped dates with Jones and Selwyn Birchwood appears next Thursday, Sept 12, at The 21st Saloon.